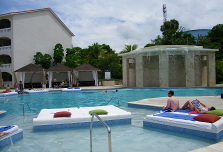 Located near the Sports Bar with a lovely pool area surrounded by beautiful beds designed for relaxing. Wi-Fi access is available here with outlets to plug into. There is also a full service bar and a keen staff waiting for you. This area is also set up to serve various foods for snack and lunch. Exclusively for guests accommodated at the Presidential Suites. The presidential units also have a very large pool area with a beautiful waterfall and great area to take in the sun and relax on one of the in-pool beds. This area has a full service bar with pool side service. 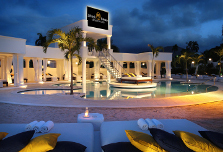 Adjacent to the pool is a large outdoor seating area with a few cabanas. Nestled in the center of the Royal Suites and in the heart of the resort. This pool is private yet conveniently located close to everything including the tennis courts, store, buffet and main office building. Of course there's a pool bar also. 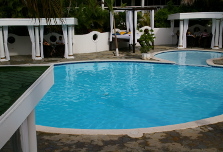 This area has three very large pools including water volleyball and a smaller pool designed for young children. There is also a full service bar with a swim-up side. This area also hosts a variety of activities scheduled to entertain you throughout the day and the activities staff will be there to assist you. This secluded area is quiet and extremely relaxing. 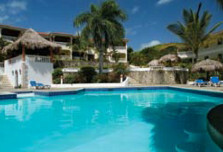 It is a great place to read a book or have a pool side siesta on one of the beach beds. This area has a full service bar with pool side service. It is located in front of the Bellini Restaurant. 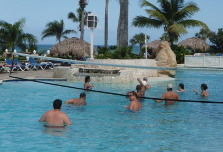 There is also a very relaxing pool area near the Penthouses. 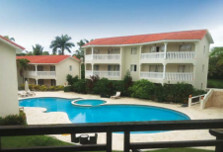 Accommodated with lounges, a full service bar with pool side service.